A sacred group of staggeringly high hills jut abruptly from the Kalahari scrub in northwestern Botswana. Standing below them you cant help but feel the powerful presence of these astounding hills. These Tsodilio Hills have been home to people for around an astounding 100 000 years and still hold humanity in awe today. The 3 hills distinctive heights and shape have given them the names Male, Female and Child and have been a sacred religious location for humanity for thousands of years. The mysteriousness and beauty of the Tsodilo Hills begin at the 4500 rock paintings that cover the stone walls of these hills that date back 100 000 years. The paintings are the only ones in a 250km radius and are absolutely unique, making them some of the finest and most important rock art discovered in the world. They are a magnificent symbolic timeline of the inhabitants who have lived here throughout time. One of the many fascinating pieces of rock art that will take your breath away is a painting over several hundred meters long which dates back over 2000 years. 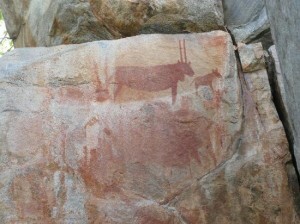 Other images of trance dances, the arrival of cattle, men on horses and geometric shapes also cover the walls and are surprisingly similar to rock paintings discovered in Angola and Zambia, far off from Botswana’s neighboring countries. Humans have used this site as a sacred place to meet with ancestors and perform religious practices for what seems like since the beginning of time. 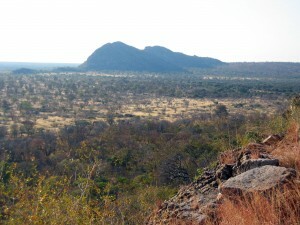 The inhabitants around the hills today believe that the Tsodilo Hills is the spot where one of the tribes who first inhabited these hills were brought down to earth by the Creator. When you stand close to the top of the Male Hill there is a dent pressed into the the rock. It is believed that this is the place where the Creator knelt down when he came to earth. The pond which has formed in an old mine in between the crevice of the hills is believe to be holy and our tour guide told us that when we washed our faces with this water we would be blessed with good luck. Many archaeologists have researched the area for the past 30 years and have dated beads, bones, tools and pottery back over 90 000 years. This was also a place of trade and great interaction between different groups at this spot as well as precolonial mining for specularite and other minerals. Tsodilo Hills has now been made a UNESCO World Heritage Site because of its spectacular religious and spiritual significance to local people. There is no denying the overwhelming feeling when you look up at these magnificent hills that tower over you when you are standing below them.